Okay I know this is weird but I swear I did take photos of this bread, seeing that I've made it more than twice. But I can't find the photos! The most surprising part was, my family members actually ate the bread, and proclaimed it good stuff (they never eat whole grain anything). With July(okay so now its August) raging its ever-scorching heat upon us, one would think "Hmm a nice cup of refreshing coconut juice will do the trick!" Well, what if I tell you there's something else slightly (well, I *may* be pushing this) better than that?? The first time I tasted it, it was at a morning market. Father bought some home because it was a hot day and, well, *it* was the perfect thing next to coconut juice. 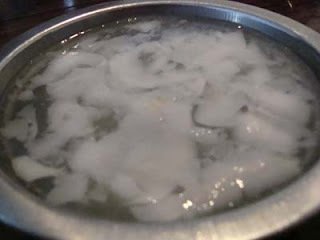 It's actually Coconut Jelly! And it was made it the coconut shell where the juice and flesh of the coconut came from, so you can still scrape bits of the coconut flesh off the inside of the coconut shell. Tasty eh? Weird how I never thought or even attempted to try to make my own at home. She attempted to make the jellies and voila! 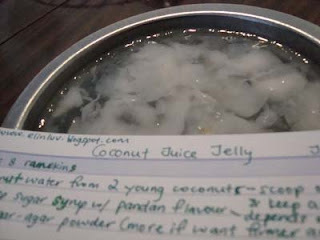 Refreshing Coconut Jellies for you to savour during a hot afternoon! I just made mine yesterday afternoon. Happened to pass by a man selling coconuts, so Father bought two young orange (not sure what's the difference between the green and the orange coconuts but...) coconuts for me to attempt the recipe. I was clueless on how to make the sugar syrup(yes I am hopeless) so I consulted Uncle Google. Turns out to be one part sugar two parts water boiled till the sugar dissolved, then it becomes sugar syrup. I added a screwpine/pandan leaf in mine during boiling stage since the recipe said "sugar syrup with pandan flavour". When cooled, the mixture doesn't firm up until placed in the refridgerator. The recipe says 4 hours at least for firming but mine firmed within an hour and a half. Overall, the jelly is good(and soft so thumbs up to this recipe!)! Although I've already added about 9 tablespoons on sugar syrup and it still wasn't sweet (just a slight tinge). However, the jellies tasted a tad sour (perhaps it's because of the orange coconuts?). Still, youngest sister gobbled up most of the agar-agar :D she seems to like it very very much. Hi people, I ain't dead yet! I haven't any stuff to post up here and bread baking progress on the Bread Magic book has come to a temporary(hopefully) halt. Insufficient funds, low stock on ingredients and jobless is really taking a toll on this and I doubt I'd be able to finish the book by end of this year. However, when i thought about it, end of this year doesn't make the project to be "one year". So in other words, i was prolly fast-forwarding too much. This makes me think about culinary arts again. Did I make the wrong choice of not pursuing it? Would it have gave me satisfaction I can barely find in this current course?